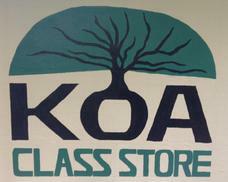 The microeconomy component of our adolescent program is largely centered around the student-run for-profit business: The Koa Class Store. Running a business first hand offers students early exposure to the meaning of money and the basis of economic systems as they plan, operate, and account for ventures relating to their business plan, while studying history, applied economics, and the realities of production, costs, investment, loss, supply and demand, marketing, accounting, use of capital resources, and division of labor. Revenues contribute to both the Montessori School of Maui community and local economy as the Koa Class fills its fundraising coffers for off-campus, inter-island curricula pursuits.